I would like to thank this buyer of mine for telling me to post his text messages as testimonial. His only wish is for me to remove his contact number. His aunt has PULMONARY TUBERCULOSIS. Her last check-up was 13 years ago. The x-ray shows that she has pulmonary tuberculosis. She remains untreated until they tried Eximius Oil. Her aunt feels weak. They needed to do something about it. 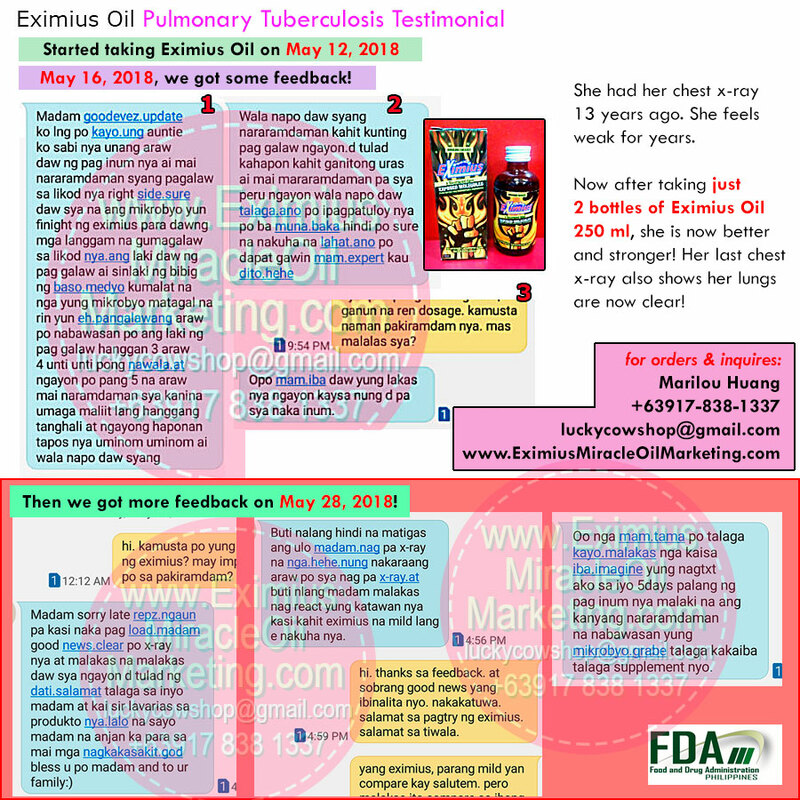 They bought 2 bottles of Eximius Oil 250 ml as their initial order, just to test. Turns out just those 2 bottles alone solve his aunt's health problem! Her aunt felt a lot stronger. And after 13 years, after taking up all those 2 bottles of Eximius Oil 250 ml, her x-ray result shows that her lungs are clear! Here's our conversation roughly translated to English. Buyer: (1) Madam good evening. Just like to update you. My Aunt said on the first day of intake, she felt that there something moving at his back, on the right side. She said that she's sure those are the microbes that Eximius is fighting, just like ants moving at her back. The movement she feels is of like the area of the mouth of a drinking glass. It's been a long time, the microbes were multiplying. On the second the, the movement she feels at her back was lessen, and gradually decreases on the 3rd and 4th day. On now on the 5th day she feels just a little during lunch time, and afternoon comes she feels there's no more movement at her back. (2) Unlike yesterday same time like now she can still feel that there's still something moving. Now there's nothing. Should she still continue taking the supplement? Those might not be enough. What should we do mam. You are the expert here. Me: ...same dosage. How does she feel now? Is she stronger? Buyer: (3) Yes mam. Her strength now is different compare to prior taking the supplement. His aunt started taking Eximius Oil on May 12, 2018. May 16, 2018 we got those feedback. And on May 28, we were able to get more feedback! Me: Hi. How is it about taking the Eximius Oil? Is she feeling better. Buyer: Madam sorry late reply. Just loaded now mobile account. Madam good News. Her xray result is now clear and she's really strong now unlike before. Thank you madam and to Sir Lavarias for his product, especially to you because you're there to those who got sick. God bless you mam and your family. Buyer: It's good that she's not hard-headed anymore. She had her x-ray exam last time and good thing her body reacted possitively because Eximius is just mild. Me: Hi. Thanks on your feedback. It's a very good news indeed. I'm happy. Thanks for trying Eximius. Thanks for trusting. Me: That Eximius, it's kind of mild compare to Salutem, but is stronger compare to other supplements. Buyer: Yes mam. You are right. It's stronger compare to others. Imagine I texted you, just for 5 days of taking it, she already felt that a lot of microbes are gone. Amazing your supplement is really something. Here's the image of our text conversation. If you know anyone who is suffering from tuberculosis, or any other health problems, please refer them to us. Our supplement might be able of help.